Free-standing rigs are inherently safer, simpler, and more aerodynamically efficient than conventional rigs. They are safer because stayed rigs are held up by hundreds of little parts, any one of which could fail or slip out and cause the rig to fall down. Eric W. Sponberg. 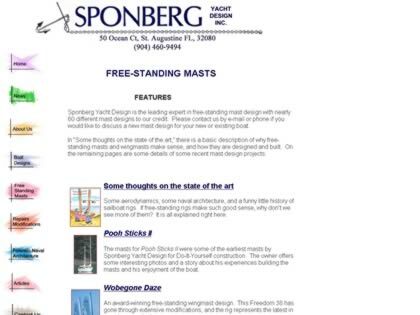 Web Site Snapshot: If available, above is a snapshot of the Free Standing Rigs web site at http://www.ericwsponberg.com/wp-content/uploads/state-of-the-art-on-free-standing-masts.pdf as it appeared when this site was added to the directory or last verified. Please Note that Boat Design Net has no involvement with the above web site; all content and images depicted in the above thumbnail are the property and copyright of Free Standing Rigs unless otherwise noted on that site. Description: Free-standing rigs are inherently safer, simpler, and more aerodynamically efficient than conventional rigs. They are safer because stayed rigs are held up by hundreds of little parts, any one of which could fail or slip out and cause the rig to fall down. Eric W. Sponberg.